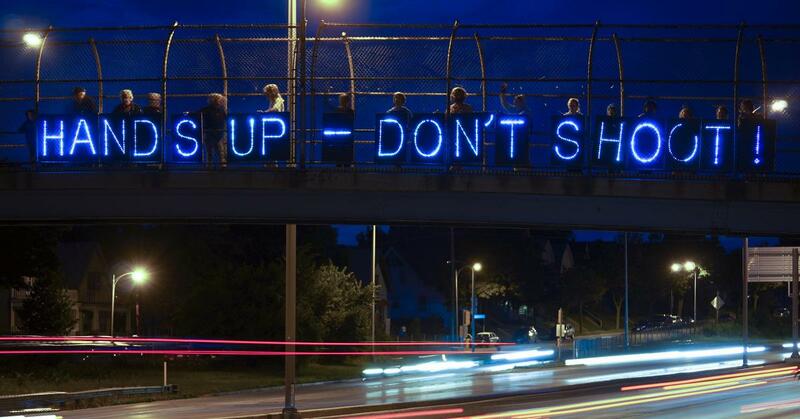 Michael Brown, Ferguson and What Can I Do? I live in a really nice neighborhood in Michigan. The bank, my wife and I own a 2100 sq foot house on just over 2 acres of land. As I write this I am looking out my office window at the 40 or so acres of woods and fields the church owns. Our property sits adjacent to a golf course. And I feel really disconnected with the events of Ferguson, MO which have re-ignited the conversation of racism in our country. What I know is that something really horrible happened. I know an unarmed young man was shot. I know their is a lot of grief, anger, hurt, fear. I know our whole country feels it. I know the world is watching how we will respond to it. I know racism is real and I live a life of privilege. I am white. This wouldn’t have happened to me. I know I have responsibility. This isn’t God’s design. I also know Jesus came to inaugurate life in the Kingdom and to show us how to live differently in a broken world. And he did that intentionally. Jesus is really clear that he only did and said what he saw or heard from the Father. In John 5:19 Jesus says this, “The truth is that the Son does nothing on His own; all these actions are led by the Father. The Son watches the Father closely and then mimics the work of the Father” (from the VOICE). So, seemingly because he was tired, in the previous chapter, Jesus stops for a drink and blows racism and all prejudice out of the water. The woman at the well. I have usually read this passage from the perspective of evangelism. Taking tips from Jesus on how to deal with objections. Recently, however, I am seeing this story as more than that. It is Jesus demonstrating that racism has no place in the Kingdom of God. Track with me here. If Jesus, as he says in both John 5 & 8, can only do what he sees the Father doing and can only say what he hears the Father say, then his stop at the well is more than just because he was tired and thirsty! Jesus stops where he stops when he stops ON PURPOSE. There is Kingdom work to be done. There is racism and sexism to be addressed (and accordingly any kind of prejudice). He intentionally stops for a drink in place where racism was high. He intentionally has a conversation with an outcast, promiscuous woman who was this sort of mingling of races and not purely Jewish. Jesus stops because he is engaged in the mission of the Father who is restoring all things to himself. Jesus stops and restores a woman whose life has been lonely and hard, he restores a village. I am made in the image of the Triune God and am being restored into the image of the Son to ever increasing glory. Admit it, that is a pretty cool sentence! But there is more. As all that is happening I am also being restored into the missional work of the Father as I observe how Jesus lived it. And Jesus lived it intentionally. See and hearing from the Father, Jesus lived an intentionally missional life where racism, in all its forms, was shown to not have a place in the shalom & wholeness of God’s Kingdom. So, what can I do? I pray. I pray all the prayers I believe everyone else is praying for Michael Brown’s family, for Ferguson, for the police officer, etc. But I am also praying differently. Because Jesus did everything intentionally out of obedience and love, that is how I want to live. I pray that the Spirit of God would help me live differently here. Because there are things I can do. I can choose to see people as people, not color. I can choose to see people as made in the image of God. I can choose to love those in front of me. I can choose to intentionally be aware of the privilege I live with and to surrender it. I can choose to intentionally be aware of the injustices in front of me and to do something about it. I can choose love. How will you choose to live in light of these events?